← Didn’t you know they sell baby chicks in hardware stores in Texas? I am a young mother, 18 when I became pregnant. This is my 2 year old son Noah John and I on a walk with my fiance, father of our next son and an amazing father figure to my first son. It was beautiful that day and we stopped to take a picture. We are using a Didymos size 6 color grown indio, our first ever wrap! It got us through our wearing career with my little one. It was a nice sweaty walk with him and he really enjoyed it as you can tell from the picture! My mamas boy who loves me so, and I love him. 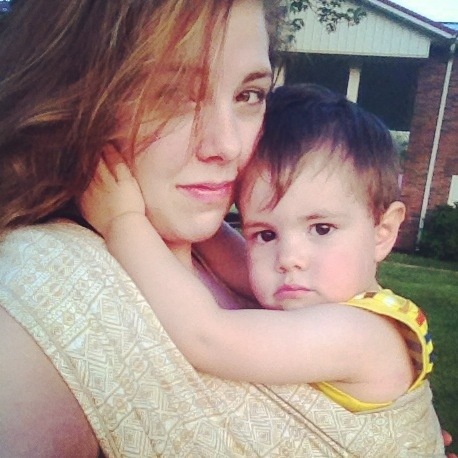 My favorite thing about baby wearing is the amazing feeling of closeness with my child. Him hugging me for this picture just describes it all. This was taken May 31st in the early evening before sunset.